Serum phospholipase A2 receptor antibodies (SAbs) and glomerular phospholipase A2 receptor antigen (GAg) deposits have been observed in idiopathic membranous nephropathy (IMN). However, the clinical application of these two biomarkers, particularly GAg deposition, needs to be further evaluated. We measured SAb concentration by ELISA and GAg deposition by immunofluorescence in 572 patients with biopsy-proven IMN. Overall, 68.5% of patients (392 of 572) had detectable SAb (SAb+), and 98.7% of patients who were SAb+ (387 of 392) and 70.6% of patients who were SAb− (127 of 180) had GAg deposition (GAg+). Compared with patients who were SAb−/GAg+, patients who were SAb+/GAg+ exhibited higher levels of proteinuria (P<0.001) and a lower chance of proteinuria remission (P<0.001). In 52 patients who underwent repeat biopsies, patients who did not achieve remission had a higher SAb+ rate on the first biopsy than patients who went into remission (P=0.001). Furthermore, SAb+ levels persisted in patients who did not achieve remission but significantly decreased in patients who achieved remission by the second biopsy. Patients who did not achieve remission also had a higher GAg+ rate on the first biopsy than patients who achieved remission (P<0.01). Sustained GAg+ deposits correlated with disease relapse. In conclusion, combining the measurements of SAb levels and detection of GAg deposition may provide additional information regarding diagnoses, treatment response, and disease relapse in patients with IMN. The discovery of an autoantibody for the phospholipase A2 receptor (PLA2R) was a landmark breakthrough in understanding the pathogenesis of idiopathic membranous nephropathy (IMN).1,2 Previous studies have shown that serum phospholipase A2 receptor antibody (SAb) level is a good marker for IMN diagnosis, disease activity monitoring, prognosis, and treatment decision making.1,3–8 Patients with SAb (SAb+) often also have glomerular phospholipase A2 receptor antigen (GAg+) deposits. Recent studies have detected GAg deposits in patients with undetectable SAb (SAb−).9–11 These studies all reported higher GAg+ deposit rates than SAb+ rates. However, the role that GAg plays in the diagnosis, treatment response, and disease relapse of patients with IMN remains unclear. Furthermore, studies have yet to determine how GAg deposition changes during disease progression. Previous studies have been limited by small sample sizes and a lack of continual GAg records. In total, 572 patients with biopsy-proven IMN were recruited in this study to answer these questions. SAb was measured by ELISA, and the presence of GAg deposition was determined in all patients by immunofluorescence. Fifty-two patients with IMN who underwent repeat renal biopsies after an immunosuppressive treatment were included to identify the changes in SAb levels and GAg intensities during disease progression. As shown in Figure 1, 392 of 572 patients (68.5%; 95% confidence interval [95% CI], 64.5% to 72.3%) were SAb+, whereas 180 patients were SAb−. The median level of SAb in patients with SAb+ was 84 relative units (RU)/ml (interquartile range, 45–178.3 RU/ml) (Supplemental Figure 1). Of 392 patients who were SAb+, 387 were GAg+ (98.7%; 95% CI, 96.9% to 99.5%). Of 180 patients who were SAb−, 127 (70.6%; 95% CI, 63.2% to 77%) were GAg+, whereas 53 patients (29.4%; 95% CI, 23.0% to 36.8%) were GAg−. The GAg+ rate was much higher than the SAb+ rate (89.9% versus 68.5%; P<0.001) (Figure 2). The combined proportion of patients with either SAb+ or GAg+ was 90.7% (Figure 2). These results indicate that the GAg is more reliable than SAb in the diagnosis of IMN (Supplemental Figure 2). In addition to the ELISA, we also performed an immunofluorescence test assay on all samples, and we observed consistent results from both methods (Supplemental Table 1). Distribution of PLA2R SAb and GAg in 572 IMN patients and the distribution of THSD7A antigen in 53 patients with out both PLA2R SAb and GAg. SAb and GAg of PLA2R were measured in 572 IMN patients. The glomerular THSD7A antigen was detected in 53 patients who were SAb−/GAg−. 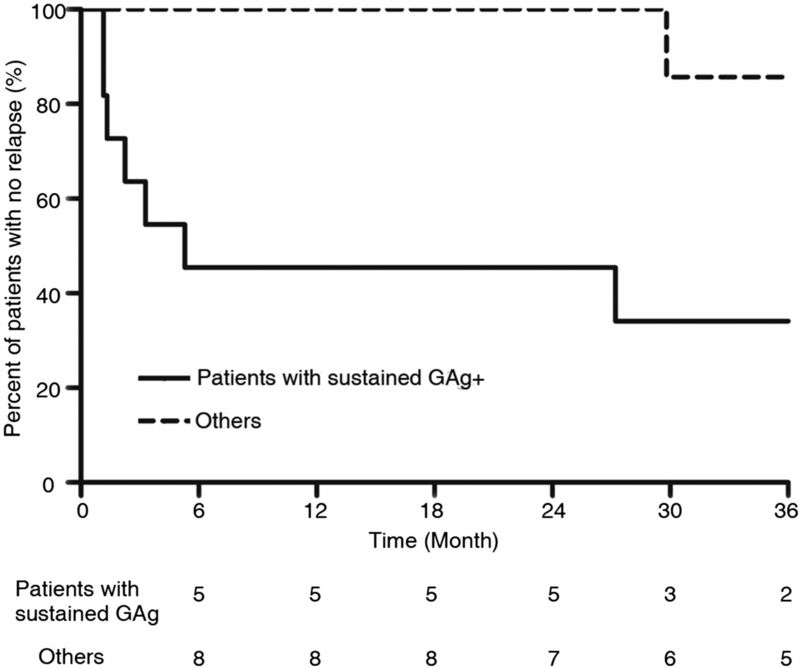 Positive rates of SAb and GAg in patients with IMN and positive rate when patients with SAb or GAg were counted together. Fisher exact test was used to compare the SAb+ and GAg+ rates (P<0.001). Patients with SAb (n=392) had a higher level of proteinuria (4.0 versus 2.6 g/24 h, respectively; P<0.001) and a lower level of eGFR (105 versus 109 ml/min per 1.73 m2, respectively; P<0.01) than those who lacked SAb (n=180). Patient antibody levels were weakly correlated with baseline proteinuria (r=0.14; P<0.01), serum albumin (r=−0.20; P<0.001), and eGFR (r=−0.20; P<0.001). As shown in Figure 1, 387 patients were SAb+/GAg+, and 127 patients were SAb−/GAg+. The SAb+/GAg+ group exhibited a higher level of proteinuria (4.0 versus 2.4 g/24 h, respectively; P<0.001) and a lower level of eGFR (105 versus 110 ml/min per 1.73 m2, respectively; P=0.002) at baseline than the SAb−/GAg+ group (Table 1). Of note, the comparison between patients with and without SAb and the comparison between patients who were SAb+/GAg+ and patients who were SAb−/GAg+ revealed very similar profiles. These results indicate that SAb is more closely correlated with disease activity and renal function decline than GAg. Kaplan–Meier analysis showed that patients who were SAb−/GAg+ experienced a higher remission rate than patients who were SAb+/GAg+ (P<0.001) (Figure 3A). The accumulated complete remission rates at 24 months after treatment were 35.6% (95% CI, 29.7% to 41.5%) in patients who were SAb+/GAg+ and 61.1% (95% CI, 51.3% to 70.9%) in patients who were SAb−/GAg+. After adjusting for baseline proteinuria, patients who were SAb−/GAg+ still had a higher chance of reaching complete remission than patients who were SAb+/GAg+ (hazard ratio, 2.1; 95% CI, 1.5 to 2.9; P<0.001) (Table 2). Kaplan-Meier analysis of disease remission and progression in SAb+/GAg+ and SAb-/GAg+ patients. (A) Survival curve for reaching complete remission (P<0.001). (B) Survival curve for reaching >40% decline of eGFR (P=0.27). The numbers of at-risk patients at selected time points (6, 12, 18, 24, 30, and 36 months) are indicated below the plot. Log-rank method was used to evaluate the significance of differences. A higher proportion of patients who were SAb+/GAg+ experienced a decline in eGFR than patients who were SAb−/GAg+, but this difference was not statistically significant (8.0% versus 5.5%, respectively; P=0.42) (Figure 3B). 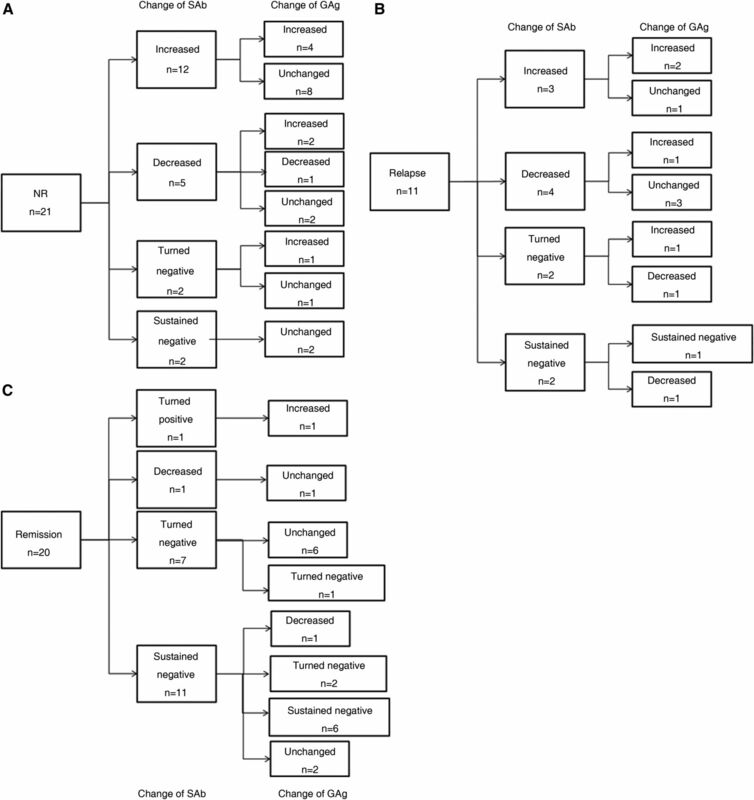 All 392 patients who were SAb+ were divided into tertiles according to antibody level. Although patients in the lowest tertile had the best outcomes, the differences among tertiles were not significant (Supplemental Figure 3A). Patients in the highest tertile were more likely to reach the end point (eGFR decline >40%) than patients in the middle or lowest tertile. However, Kaplan–Meier analysis did not yield any significant difference among the tertiles (Supplemental Figure 3B). Fifty-three patients were double negative for both SAb and GAg. We performed immunohistochemical staining of the Thrombospondin Type 1 Domain–containing 7A (THSD7A) antigen in these patients and found distinct granular THSD7A antigen deposits in four patients (Figure 1). THSD7A was detected in a fine granular pattern in the subepithelial deposits along the glomerular capillary loops (Supplemental Figure 4). In total, 52 patients with IMN who underwent repeat renal biopsies were recruited. The median interval between the two biopsies was 13.1 months (interquartile range, 12.0–18.8 months). All patients received immunosuppressive therapy between the two biopsies. Twenty-one patients had not achieved remission at the second biopsy; eleven patients had undergone proteinuria remission but relapsed before the second biopsy, and remission was achieved in 20 patients at the second biopsy. Twenty-one patients failed to achieve remission by the second renal biopsy. SAb was present in 19 patients at the first biopsy and only disappeared in two patients by the second biopsy. SAb levels increased in 12 patients, decreased in five patients, turned negative in two patients (follow-up revealed that one of two patients achieved remission in 1 month and that one patient achieved remission in 5 months), and remained negative in two patients. Changes of median SAb level are shown in Supplemental Figure 5A. In all 21 patients who failed to achieve remission, GAg deposition was observed at first biopsy and remained present through the second biopsy. Of these patients, the GAg intensity increased in seven patients, remained unchanged in 13 patients, and decreased in one patient (Figure 4A, Table 3). Dynamic changes of SAb levels and GAg intensities from first to second biopsies in patients failed to achieve remission, relapsed and achieved remission. (A) Changes in SAb levels and GAg intensities in patients who had not achieved remission. 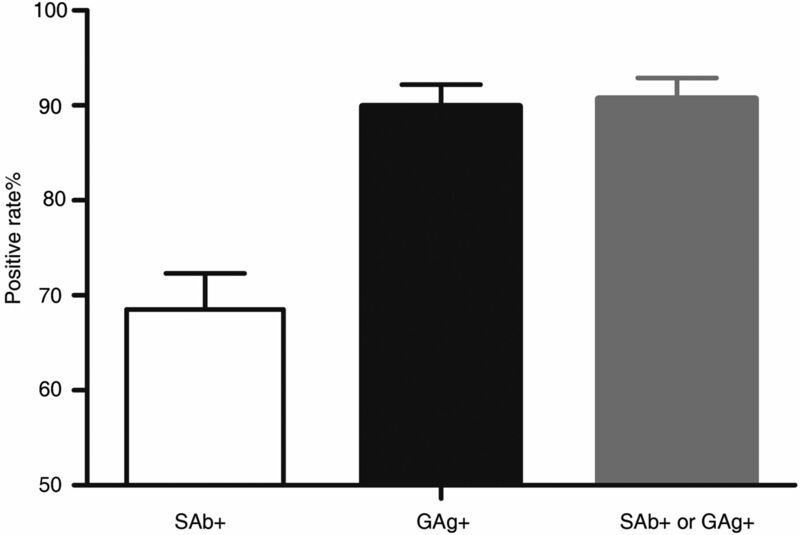 (B) Changes in SAb levels and GAg intensities in patients who had relapsed. (C) Changes in SAb levels and GAg intensities in patients who had achieved remission. NR, no remission. Eleven patients entered remission but relapsed before the second biopsy. SAb was present in nine patients at the first biopsy but turned negative in two of them by the second biopsy. The SAb level increased in three patients, decreased in four patients, turned negative in two patients, and remained sustained negative in two patients. Changes of median SAb level are shown in Supplemental Figure 5B. GAg deposition was present in 10 patients at the first biopsy and remained present through the second biopsy. The GAg intensity increased in four patients, remained unchanged in four patients, decreased in two patients, and remained sustained negative in one patient (Figure 4B, Table 3). All patients were continually followed after the second biopsy. Among patients who failed to achieve remission or relapsed at the second biopsy, 13 showed decreased SAb levels, whereas 15 patients showed increased SAb level by the second biopsy. Patients with decreased levels had a greater chance of reaching proteinuria remission during the follow-up period than patients with increased antibody levels (69.2% versus 46.7%, respectively; P=0.04) (Supplemental Figure 6). Twenty patients achieved overall remission by the second biopsy. SAb was present in eight patients at the first biopsy but turned negative in seven patients by the second biopsy when the patients achieved remission. The SAb level became positive in one patient, decreased in one patient, turned negative in seven patients, and remained negative in 11 patients. It is worth mentioning that proteinuria relapse occurred in one patient whose SAb+ titer increased and that one patient showed a slight decline in SAb during proteinuria remission. Change of median SAb level were shown in Supplemental Figure 5C. GAg deposition was present in 14 patients at the first biopsy but disappeared in three patients by the second biopsy. The GAg intensity increased in one patient, decreased in one patient, turned negative in three patients, remained unchanged in nine patients, and remained sustained negative in six patients (Figure 4C, Table 3). Twenty patients achieved remission at the time of repeat biopsy. The follow-up revealed that seven of 11 (63.6%) patients with sustained GAg+ through the second biopsy had relapsed, whereas only two of nine (22.2%) patients who had no GAg deposition at the second biopsy had relapsed. The Kaplan–Meier analysis also indicated a higher risk of relapse in patients with sustained GAg+ than in patients who were GAg− (Figure 5) (P=0.03). We also correlated the GAg semiquantitative data at the time of remission with chance of relapse. The Cox regression analysis showed that the intensity of GAg staining when remission was achieved was an independent risk factor in predicting relapse after adjusting for complete remission/partial remission status (hazard ratio, 3.1; 95% CI, 1.3–7.2; P<0.01). These results indicate that patients with sustained GAg deposits, even those who achieved clinical remission, might be at higher risk of relapse than those without GAg deposits. Kaplan-Meier analysis for proportion of relapse in patients with sustained GAg+ and patients without GAg at the second biopsy. Patients with sustained GAg+ showed higher risk of relapse than patients without GAg (P=0.03). Log rank method was used to evaluate the significance of difference. SAb and GAg at the first biopsy correlated with patient outcomes. Patients who failed to achieve remission showed a much higher SAb+ rate at the first biopsy than patients who achieved remission (90.5% versus 40%, respectively; P<0.001). The GAg+ rate at the first biopsy in patients who failed to achieved remission was also higher than that in patients who achieved remission (100% versus 70%, respectively; P<0.01) (Table 3). The combination of SAb+/GAg+ has a significant predictive value for no remission (odds ratio, 7.8; 95% CI, 1.6 to 39.5; P<0.01), and the combination of SAb−/GAg− has a significant predictive value for remission (odds ratio, 13.3; 95% CI, 1.5 to 121; P=0.01). However, we found the predictive value of the SAb−/GAg+ pattern to be not significant. The discovery of SAb and its clinical translation in patients with IMN were tremendous advances in the precise diagnosis, disease activity, treatment response evaluation, and prognosis of this disease.1,3–5,8,12,13 In addition, deposition of GAg in the glomeruli provides a supplementary marker in the diagnosis of IMN, and it can be detected in patients with IMN and without detectable SAb.9–11 However, characteristics of GAg deposition and its relationship to disease activity, treatment response, and relapse had not been fully explored until this study. In this study, the SAb+ rate was 68.5% in a cohort of 572 patients with IMN, which is similar to rates reported in previous studies.6,7,9 In patients who were SAb+, 98.7% were also GAg+. Interestingly, a remarkable proportion of patients who were SAb− (70.6%) was also GAg+. The total GAg+ rate was significantly higher than the total SAb+ rate, and the rate increased further when patients with either SAb+ or GAg+ were counted together. Our finding indicates that GAg deposition combined with SAb may serve as a more sensitive biomarker in the diagnosis of IMN than SAb alone. Patients with SAb had higher proteinuria levels and lower eGFR levels than those without SAb, which is consistent with previous reports.3,14 We further evaluated whether the deposition of GAg aided in the activity, diagnosis, prognosis, and treatment of IMN. By comparing the clinical characteristics of patients who were SAb+/GAg+ with those of patients who were SAb−/GAg+, we found that patients who were SAb+/GAg+ showed higher proteinuria levels and lower eGFR levels than patients who were SAb−/GAg+. (However, although the difference for eGFR was statistically significant, it was quiet small and might not be clinically important.) In addition, patients who were SAb−/GAg+ had a higher remission rate than patients who were SAb+/GAg+. These results indicate that SAb is a more robust marker to predict disease activity, severity, and response to therapy than GAg. Are patients with SAb−/GAg+ in the early stage of their disease?15,16 The repeat biopsy provided information to help us answer this question. In patients whose SAb levels became absent and patients who had sustained negative SAb levels at the second biopsy, the GAg deposition showed a trend toward decreasing or turning negative at the same time, indicating that GAg deposition may fade as the SAb production is inhibited. These results also indicated that immunosuppressive treatment could induce not only the disappearance of SAb but also, the disappearance of GAg. In patients who experienced relapse, the GAg showed sustained intensity or a trend toward increasing, indicating that the presence of or increase in GAg may trigger of relapse. However, several exceptional patients had discrepancies between changes in SAb and GAg. For instance, some patients with SAb levels that decreased or turned negative had increased GAg intensities. The association between SAb and GAg and the underlying mechanisms need additional exploration in future studies. In addition to the large sample size, another strength of this study is its analysis of SAb and GAg changes in patients who underwent a repeat renal biopsy after treatment. The SAb+ rate at the first biopsy was significantly higher in patients who had not achieved remission than that in patients who had achieved remission by the second biopsy. In patients who had not achieved remission, SAb turned negative in only two of these patients, and the median SAb titer did not change significantly by the second biopsy. GAg intensity showed a trend toward increasing or remaining stable in patients who failed to achieve remission. However, in patients who had achieved remission, SAb+ levels turned negative in seven of eight patients, and the median SAb− titer decreased significantly by the second biopsy. The GAg deposition in these patients trended toward a decrease or remained unchanged. The GAg+ rate at the first biopsy was also higher in patients who had not achieved remission by the second biopsy than in those patients who had, indicating that the GAg+ status was also related to patient response to treatment. Frequent relapse after remission is a challenge in the treatment of patients with IMN and is related to the therapeutic side effects and the outcome.17–19 A previous study showed that patients with sustained SAb+ after immunosuppressive treatment exhibited a higher rate of relapse during follow-up.4 However, to our knowledge, no study has observed the role of persistent GAg deposits in the relapse of patients who had achieved clinical remission. We found that the patients who had achieved remission and had persistent GAg deposits at the time of the second biopsy were more likely to relapse during follow-up than patients without GAg deposition who had achieved remission. Persistent GAg deposition may act as a trigger that restarts the immune response and leads to disease relapse. Taking this into consideration, the clinical remission (proteinuria returned to normal and PLA2R autoantibody turned into negative) does not reach the real remission, and we may need to pursue the histologic remission (both PLA2R autoantibody and GAg turned into negative) to avoid the disease relapse. Certain limitations exist in this study. First, the study was intrinsically limited by its retrospective nature. Second, various therapies were given to the patients, and we were unable to obtain precise data on the doses and course of treatment that each patient received, which made comparing treatment responses to different therapies difficult. In conclusion, GAg deposits can be detected in a large proportion of patients who were SAb− and provide a more reliable means by which to diagnose IMN compared with SAb detection alone. SAb was more closely correlated with disease activity, renal function decline, and treatment response than GAg. Persistent GAg deposits were correlated with a poor response to treatment and disease relapse. 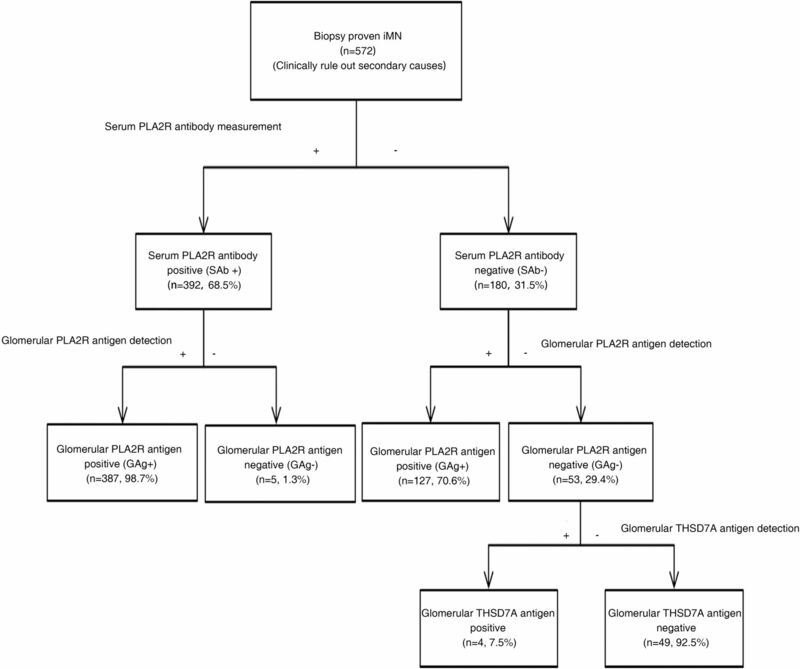 Combining the measurement of anti-PLA2R antibodies and the detection of the PLA2R antigen may provide additional information pertaining to the diagnosis, treatment response, and disease relapse of patients with IMN. Informed consent was obtained from all recruited patients, and the study was approved by the local ethics committee. During patient follow-up, 90.7% (519 of 572) of patients received immunosuppressive treatment. Immunosuppressive regimens included glucocorticoids and Tripterygium wilfordii (65.0%), glucocorticoids and tacrolimus (32.4%), glucocorticoids and cyclosporin A (16.4%), glucocorticoids and cyclophosphamide (11.7%), and others (1%; glucocorticoids and mycophenolate mofetil). All 52 patients who underwent a second biopsy received an immunosuppressive treatment between the two biopsies. Immunosuppressive regimens included glucocorticoids and T. wilfordii (50%), glucocorticoids and tacrolimus (46.2%), glucocorticoids and cyclosporin A (1.9%), and cyclophosphamide (1.9%). Glomerular THSD7A antigen deposits were measured using the immunohistochemical method reported by Tomas et al.20 Briefly, paraffin sections of renal biopsies were deparaffinized and rehydrated. After antigen retrieval, the sections were incubated in 0.05% Triton X-100. The THSD7A antigens were conjugated by a rabbit anti-THSD7A (Atlas Antibodies) followed by a horseradish peroxidase–conjugated secondary antibody. Staining was visualized using the DAB System. Data are presented as medians (interquartile ranges), and intergroup comparisons were performed using a nonparametric test (the Mann–Whitney test). The Fisher exact test was used to assess the distributions of categorical data. A Kaplan–Meier survival analysis was performed to compare complete remission rates, renal function progression and relapse rates among groups, and the log-rank method was used to evaluate the significance of differences. A Cox regression model was used to verify independent predicting factors for achieving complete remission. Significance was defined as P<0.05. The authors acknowledge support from National Basic Research Program of China 973 Program No. 2012CB517600 grant 2012CB517606, Major International Joint Research Program of the National Nature Science Foundation of China grant 81320108007, National Natural Science Foundation of China grant 81500547, Natural Science Foundation of Jiangsu Province grant BK20150560, and Natural Science Foundation of Jinling Hospital grant 2013041. The abstract was selected for poster presentation during the American Society of Nephrology Kidney Week November 5–8, 2015 (San Diego, CA). H.-Z.Q., M.-C.Z., and W.-B.L. contributed equally to this work. This article contains supplemental material online at http://jasn.asnjournals.org/lookup/suppl/doi:10.1681/ASN.2015080953/-/DCSupplemental.